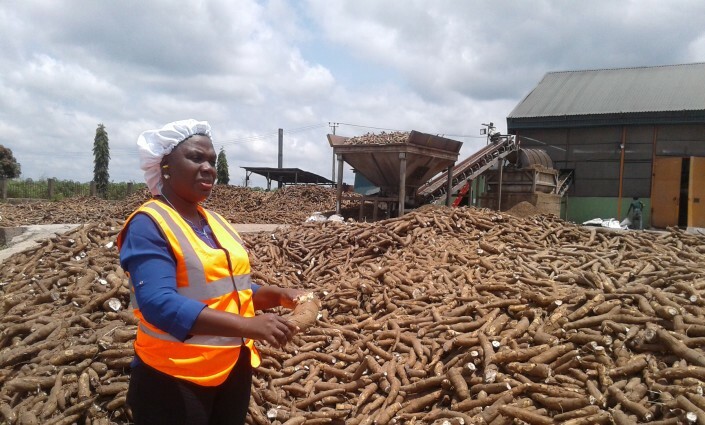 Yemisi Iranloye, managing director and CEO of Psaltry International Limited, a large cassava processor based in south-west Nigeria, has built her success on an inclusive business model that places smallholder farmers at the centre of operations. In 2005, Yemisi Iranloye founded her cassava production company, Psaltry International Limited, with personal savings from marketing farm produce. Six years later, in response to market demand for processed cassava products, she expanded the business with the establishment of a factory in Alayide village, Oyo State. Demand for these high-quality cassava products among Nigeria’s manufacturing industries continues to grow due to fluctuations in foreign exchange rates and scarcity of imported grains such as wheat and barley, which make locally-sourced and readily-grown raw materials like cassava more cost-effective. “Connection to the market has not been difficult because our product (food-grade starch) is a raw material used by the industrial sector and our quality is very high. It can be compared to quality anywhere in the world,” Iranloye explains. Large Nigerian companies such as breweries, pharmaceuticals and food processors use food-grade starch to manufacture their products, whilst confectionary and flour milling companies use HQCF as a cheaper alternative to wheat for incorporating into their sweet treats and flour. Since expanding, Psaltry International has become one of the largest starch producing companies in Nigeria with two production lines each producing 20–30 t of food-grade starch per day, amounting to 10,000 t per year. Even with this scale of production, Iranloye is aware that demand for starch in Nigeria still outweighs her company’s current supply. However, investment from manufacturing companies is helping to address this shortfall. For example, after trialling the use of cassava starch in its brewing process in 2014, Nigerian Breweries Plc partnered with Psaltry International, and the International Fertiliser Development Centre (IFDC) under the Dutch-funded 2SCALE programme to improve the cassava value chain, and ensure a steady supply of high-quality cassava from within the country. Through the partnership, IFDC and the NGO trained Psaltry’s outgrower farmers to improve the quality and output of cassava, and as a result, Nigerian Breweries Plc is now the largest buyer of Psaltry International’s food-grade starch. Nigeria’s national banks have also played a role in financing the company’s operations. Psaltry’s Alayide factory was built with funds from the Central Bank of Nigeria’s Commercial Agriculture Credit Scheme, distributed through FirstBank Nigeria. Two years later, the subsequent growth in the company’s profits enabled Iranloye to build a second factory. According to Iranloye, Psaltry’s inclusive business model — based on sourcing raw material from smallholder farmers — is the key to the company’s overall success. In 2012, Psaltry began its first outgrowers’ programme by deliberately targeting smallholder suppliers and offering them higher prices to encourage subsistence farmers to expand and commercialise their cassava production. The programme’s success enabled Psaltry to expand its sourcing to other rural communities within a 50 km radius of the Alayide factory and increase the number of outgrower suppliers to about 2,000 farmers. The Alayide factory was strategically positioned near to these smallholder suppliers to reduce post-harvest losses. Through her experience in the cassava sector, Iranloye had observed that when farmers transported their cassava over very long distances, the starch content could drop from 17% to 5% and tubers would often rot. The proximity of the Alayide factory to the farmers ensures that good quality, mature cassava tubers with high starch content are processed within 24 hours, avoiding unnecessary losses. The steady and reliable supply generated by these local farmers has allowed the company to maintain a relatively stable price throughout the year to undercut international pricing. Busari Dauda, the Alayide village head, who has farmed cassava for 30 years, states that with the introduction of the outgrowers’ programme, “the first major improvement was the increase in my farm size from 2 to 20 ha in 2 years as a result of the services rendered by Psaltry. Currently, I have over 60 ha of farmland.” Psaltry has been able to support the growth of smallholders’ farms with help from a cloud-based app called Farmforce, which uses GPS technology to track outgrowers’ yields and monitor their needs in terms of extension services. The app can predict the yield and date of harvest for each individual farm, allowing Psaltry to oversee its supply. This data not only discourages farmers from side selling, but also helps them to obtain bank loans for planting material and inputs, such as herbicides and fertilisers, which Psaltry supplies at a subsidised rate. To ensure the company receives its expected supply, farmers are required to sign a memorandum of understanding committing them to selling their produce to Psaltry alone and adhering to the company’s cassava quality standards before receiving the loan payment. However, to further increase outgrowers’ commitment, as well as their economic empowerment, Iranloye is keen to grow the shares that the outgrowers themselves have in Psaltry so that they collectively own 10% of the company. In addition to building the capacities of smallholder suppliers, Psaltry International concentrates on strengthening the capacity of its employees, which have more than doubled since 2013 to nearly 300–40% of whom are women. The company holds an annual staff training programme in partnership with Nigerian Breweries’ Training School at Ibadan, and technical training from Sino-Food Machinery has made it possible for Psaltry staff to carry out in-house factory maintenance to reduce technical breakdowns. At the management level, Stanford Institute for Innovation in Developing Economies Seed Coaches, provides strategic training for Psaltry staff. “In the last 17 years, I have received several trainings — training on entrepreneurship, on how to lead as a woman and in agriculture itself,” emphasises Iranloye. The best information resource on agribusiness and agricultural development in Africa, the Caribbean and the Pacific.